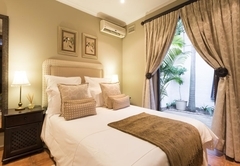 Five Burnham Guest House is a 4 star graded guest house offering Umhlanga Rocks accommodation in 8 guest rooms. 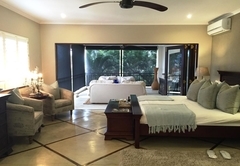 Five Burnham is a boutique guest house in Umhlanga Rocks. 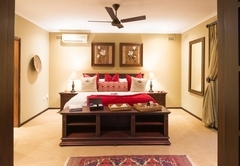 All the rooms have luxury accommodation to complement the serene atmosphere and to re-enforce the charm of a classic colonial ambiance. 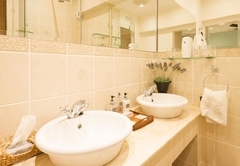 Five Burnham has a total of eight guest rooms all en-suite. 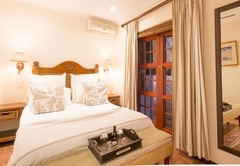 All the rooms are tastefully decorated with dedicated DSTV, air-conditioning, Wi-Fi, coffee and tea making facilities, bathrooms with separate glass showers, ceiling fans, hairdryers, mini bar, safety deposit box, 24 hour CCTV, secure parking, daily newspaper delivery and laundry service. Unfortunately no children under the age of 14. 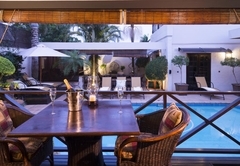 The public areas include a swimming pool and lapa area for barbeques and entertaining. You can entertain your colleagues and we will provide salads and meat or whatever your requirements. 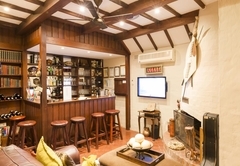 We are fully licensed and have a charming bar and terrace area to relax and unwind. 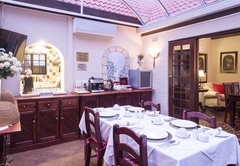 Our breakfast consists of a delicious continental plus a full hot English breakfast. 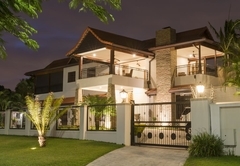 Five Burnham is close to the CBD, ICC, Gateway Shopping Centre, uShaka Marine World and the King Shaka International Airport. There are fantastic golf courses and stunning beaches close to the property. 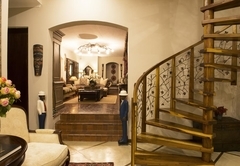 We are two hour’s drive from national game parks, Drakensberg Mountains, La Lucia, Midlands and the Zulu Kingdom. Kwazulu Natal is rich in culture and diversity. 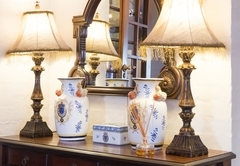 All spheres of amusement are effortlessly attainable and within range of Five Burnham Guest House. Familiarize yourself with the speckled beaches and glimmering ocean backdrops that are within tottering distance from the house. Kwazulu Natal boasts some of the finest golfing turf in South Africa. Zimbali, Selbourne, San Lameer, Umhlali and Mt Edgecombe all offer eighteen holes. We have a friendly compliment of staff for which we proud ourselves and they too strive to maintain the standards of excellence. Our motto is cleanliness, friendliness, attention to detail and to enjoy what we do to make the guests stay more enjoyable. 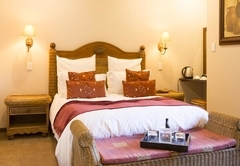 Luxury king size bed, en-suite bathroom with a patio overlooking the pool area, air-conditioning, flat screen TV with DSTV Hotel bouquet of channels, hairdryer, complimentary toiletries, coffee and tea-making facilities, minibar, safe, and free Wi-Fi. 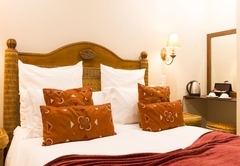 Queen size bed, en-suite shower, air-conditioning, flat screen TV with DSTV Hotel bouquet of channels, hairdryer, complimentary toiletries, coffee and tea-making facilities, minibar, safe, and free Wi-Fi. This room does not have an outside patio. Either King size bed or twin beds, with doors leading out to a small patio. 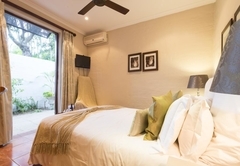 air-conditioning, flat screen TV with DSTV Hotel bouquet of channels, hairdryer, complimentary toiletries, coffee and tea-making facilities, minibar, safe, and free Wi-Fi. 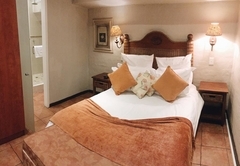 Small room with double bed, shower ensuite, Hotel Bouquet DSTV, airconditioning, hair dryer, safe, WIFI, mini bar fridge, tea & coffee facilities and doors leading out to small patio. 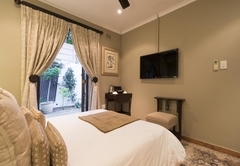 Small room with double bed, ensuite, air conditioning, Hotel bouquet DSTV, hairdryer, safe, WIFI, mini bar fridge, tea & coffee making facilities This room has an outside entrance. 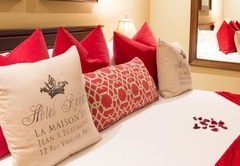 One room has a kingsize or twin bed and the other has a double bed. 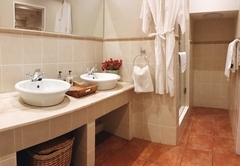 Full bathroom with bath & shower and 2nd toilet, safe, Hotel bouquet DSTV, hairdryer, air-con, mini bar, tea and coffee station. 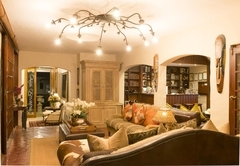 The family room has doors opening onto a private patio. 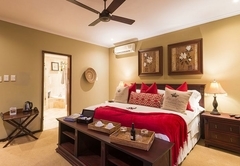 Small room with a double bed, shower ensuite, Hotel bouquet DSTV, WIFI, airconditioning, mini bar fridge, tea and coffee facilities. This room is in the middle of the house and has no windows to the outside. 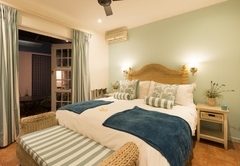 Luxury king size bed, en-suite bathroom with a private patio/lounge area with a sea view, air-conditioning, satellite decoder with large flat screen television, coffee and tea-making facilities, minibar, safe, and Wi-Fi. Response timeFive Burnham Guest House typically responds to requests in 5-10 minutes.